Anyone who is trying to break into the music world needs to have high quality tools. But just how can you make sure you have the best tools available? Well, you start with the basics and do your research. Luckily for you, we’ve done a lot of the research for you and we’re going to start out with the best in-ear monitors. Take a look at this in-ear monitor buying guide and you’ll be able to see which monitors are best for you and your specific situation. Bluetooth: Bluetooth is a type of technology that allows your monitors to interact with other tools, like a microphone, music players or instruments. 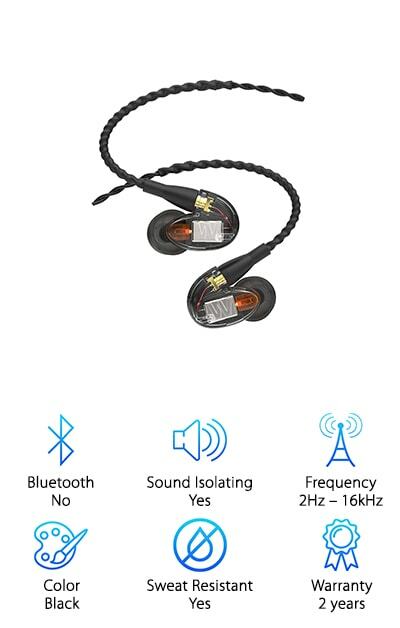 The really great thing is that these are often the best wireless in-ear monitors you’ll find. Sound Isolating: This technology actually helps to isolate the sound that you want and gets rid of the sound that you don’t want. That way, you’ll actually be able to focus on what you need instead of being distracted by what’s happening around you. Frequency: Different systems have different frequencies, which means that they can hear and react to different tones. Having a wider range of frequencies available means that you can accomplish even more with your music and get even more variety to the sound that you use. Color: In general, in-ear monitors come in only a few different colors, like clear or black, but on occasion, you’ll be able to find some specialty ones in different colors. If you’re looking for something unique finding color options might be important to you. Sweat Resistant: You’re going to be using these monitors inside your ears, which means you need something that won’t get sweaty as you continue to work. If your earbuds are sweat resistant you can feel more comfortable throughout your work, no matter how warm it gets. Warranty: You want tools that are going to last and a warranty lets you know that you have that. A long warranty is generally a sign that the company stands behind their product and that you can expect it to work for a longer period of time. With so many different in-ear monitors out there, it can actually be difficult to choose which one is best for you. Luckily for you, we’ve actually done most of the work for you. You can take a look at each of the options we’ve found and then make your own choice because there are the best in-ear monitor reviews you’ll find. We’ll take a look at each of the categories we’ve discussed above and several more, to find the best out of them all. So let’s get moving. Our top pick is the Westone UM Pro 10. These monitors are great for new musicians and professionals alike; in fact, they’re the best in-ear monitors for musicians that we’ve found. They’re compact, low-profile and still built to give you plenty of power and sound. They have between 20Hz and 16,000 Hz frequency response and use a twisted cable that improves strength while reducing noise. The ear tips are ergonomic and made with silicone and foam to make them really comfortable to wear for an extended period and also to ensure that you get some of the best noise isolation. That’s definitely important if you’re trying to make professional quality music (or even if you’re just listening to some of your favorite bands). Use an audio connector and 3.5 mm stereo plug to connect and you’ll be able to get started just like that. Not to mention they have detailed clarity and a full range of sound, for whatever you’re doing, plus they’re designed for musicians who need to hit the studio or the stage. 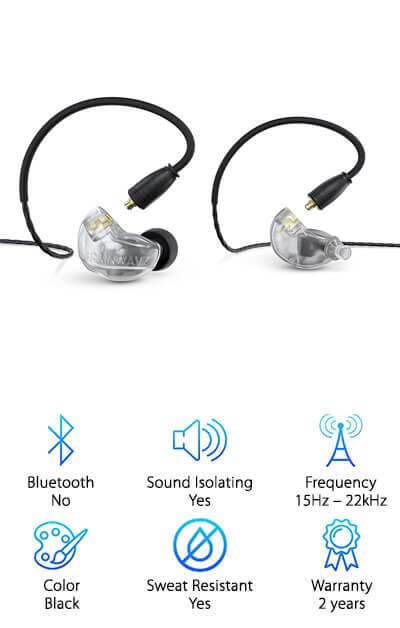 Our best affordable in-ear monitors are the TaoTronics In-Ear Monitor, which provides noise canceling capabilities along with complete auditory immersion for up to 15 hours on a single charge. With just one push of a button you can access monitoring mode or you can use the noise cancelling microphone to listen and communicate on the phone. Made with aluminum, you get a sleek and stylish look that’s also low profile. The box attachment lets you adjust the volume; improve noise cancellation, and a whole lot more. All it takes is one hour of charging and these super lightweight headphones are ready to go for the full 15. 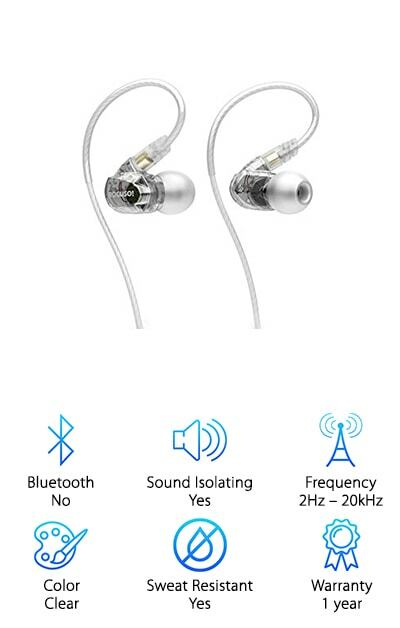 Just plug them in with the 3.5 mm audio connector and you can listen to your favorite music or get started with creating your own music. They fit comfortably in your ears, even when you’re moving around and have clips to hold them securely as well, plus you get extra ear buds and hooks. That definitely makes them the best cheap in-ear monitors for anyone. The SOCUSO In-Ear Monitor comes in three different colors (though the standard is clear) and offers stereo, HD, and acoustic sound quality to make them some of the best in-ear monitors for drummers. Not only that but it has noise isolation features to get rid of up to 90% of outside noise. Completely sweat proof and complete with hands free calling, the system even lets you adjust everything you need (including volume and song skipping) entirely hands free. 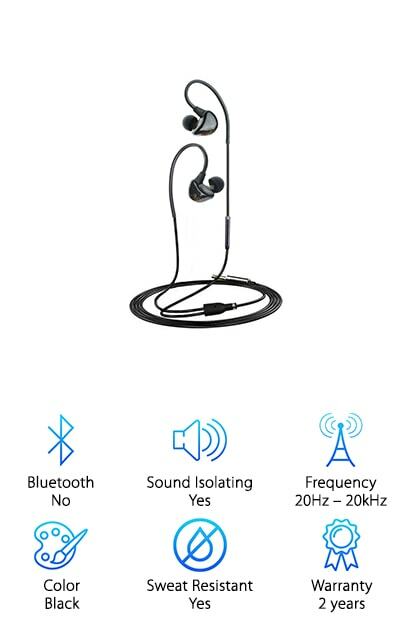 Whether you’re planning on going out running, jogging, stage monitoring or anything else, these headphones are designed to make it easier for you to go about your day with crisp high notes and deep bass sounds. If you decide you don’t like them within 30 days you can return them for a complete refund and if there’s a problem within the first year you’ll be able to return it under the warranty, to get something new. 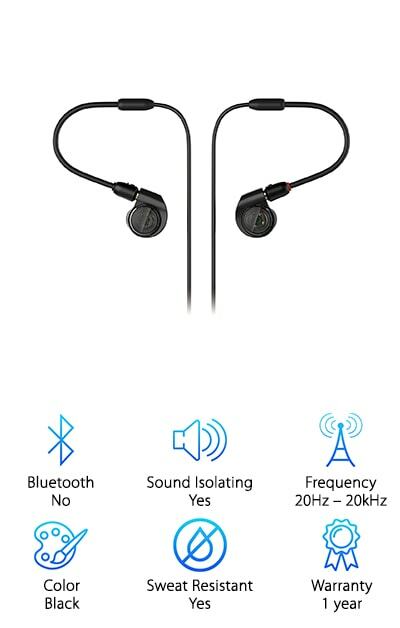 You can connect through the 3.5 mm jack to anything you want and once you slip them in your ears you’ll have an ergonomic and comfortable design. The MEE Audio In-Ear Monitors are available in three different colors and provide a wide volume range and strong sensitivity to different decibels. On top of that, they are noise isolating and have a universal fit style that allows them to sit comfortably in your ears. With superior clarity and deep bass, you’ll also get versatility, including detachable cables. Sweat resistant and designed with an aluminum coil, these monitors are lightweight and good for any purpose. You can use them to create your own music or to listen to your favorite tunes. What really makes this set of headphones special is that they come with a lifetime replacement guarantee in case anything happens. You can get a replacement at half price. If anything happens within the first year they’re covered by a full warranty. Included in the box is a carry case, extra ear buds, and extra clips, plus a spare cable for charging. 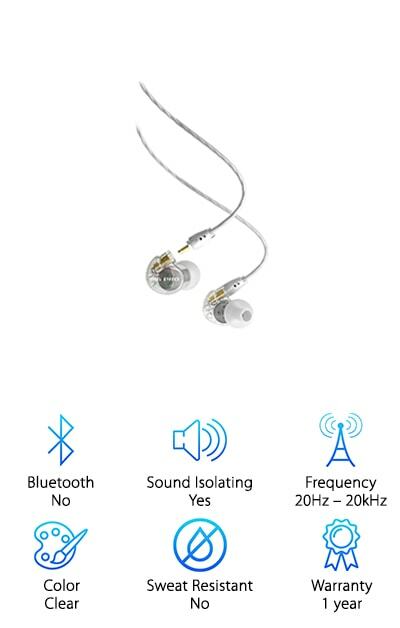 With the Avantree In-Ear Monitor you’re getting a noise isolating design that fits your ears because these monitors are designed to sit ergonomically in your ear all day if you want them to. They even come with several different sizes of ear buds to get the ideal fit for you. The molded ear hook even keeps them locked onto your ears and they are completely sweat resistant, so you can even use them when you are working out. With two different drivers to provide clear sound for bass as well as treble and mid-tones, they have an inline microphone and let you listen to calls or your favorite music. 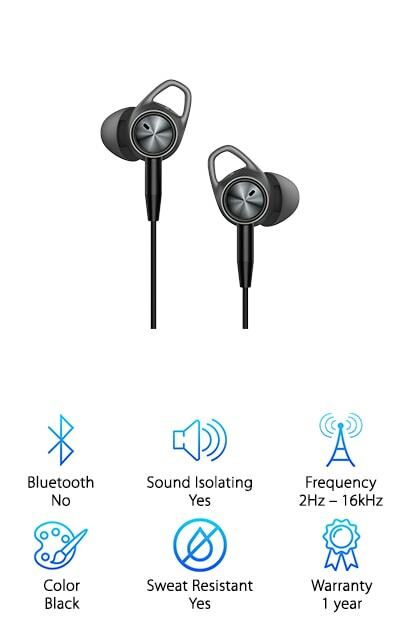 Connect through your normal 3.5 mm audio jack and these lightweight headphones will work with any of your favorite devices, including Apple and Android. While you’re listening to music or working on your own music you’ll be able to cancel out whatever is happening outside, which is the whole point of noise-canceling headphones. These Audio-Technica In-Ear Monitors come in three slightly different styles that provide a slightly different look but you’ll find some of the best value in-ear monitors. They have memory cable loops to fit over the ears and create a more comfortable style on top of the ear bud design. The cable can be detached for easy transport and increases the durability of the system. They have a specially designed housing as well, which creates a higher quality sound profile, eliminating outside noise and letting you become truly immersed in whatever you’re listening to, especially with how loud these can be. The proprietary system of dual phase, push-pull drivers creates an accurate and clear sound that you can use for creating music or simply listening to your own. They are lightweight and while they can be a little bit bulkier than some, they still provide a good fit for most users. You’ll also have a case to carry them in for added protection and extra ear buds, just in case you need them. Available in several different colors, the BASN Bsinger In-Ear Monitor offers a braided cable and an inline microphone headset cable as well. On top of that, it has dual dynamic drivers which can provide even more sound accuracy and clarity. That way you’ll have the ability to work on music or listen to it with no problems. You can use the 3.5 mm jack to connect with just about anything, including Apple or Android devices. You’ll also have ergonomic ear hooks and several sizes of sleeves that ensure an ergonomic and comfortable fit, customized to your needs. These monitors use a detachable cable, behind the ear style and dedicated tweeter and woofer. Overall, you’re getting a high quality sound and deep bass as well as clear and bright sounds through all other tones. It even comes with a one year warranty so you know you’re getting something high quality and durable that will last. The LyxPro In-Ear Monitors come with their own case that makes traveling a whole lot easier and even include several different sizes and shapes of ear buds to get the perfect, most ergonomic, fit. The cable is a braided design that’s made to improve durability and the fact that they detach makes them even stronger. Noise isolating, these headphones give you excellent clarity to the sound and let you work in the studio with no problems at all. They’re actually specially made for singers and other musicians and keep out just about anything. Lightweight and easy to fit into the ear, even for extended use, they can are simple to adjust and can use silicone or foam tips. Not only that but they have a wide frequency range to make sure you hear every bit of your music, from start to finish. You just plug them in via a 3.5 mm audio cable and you’ll be ready to go just like that. If you’re looking for simplicity along with functionality the Brainwavz Professional Monitor Earphones are a good choice. They come in three different colors to fit your personal preference and style and also have high quality technology. In fact, the balanced armature technology means that they reproduce sound very well, and do so in a well-rounded form. You’ll get the bass, the vocals and more, whether you’re listening to your favorite songs or creating your next big hit. Even better, the ergonomic design and memory formed cables mean they fit just right, all the time. The braided cable increases overall durability and there are several different sizes and types of tips included to get just the right fit. The case makes them simple to carry and the 3.5 mm jack means they can be connected to just about any device, including Apple and Android options. If you really want to keep them secure you can even use the included shirt clip and Velcro cable tie. 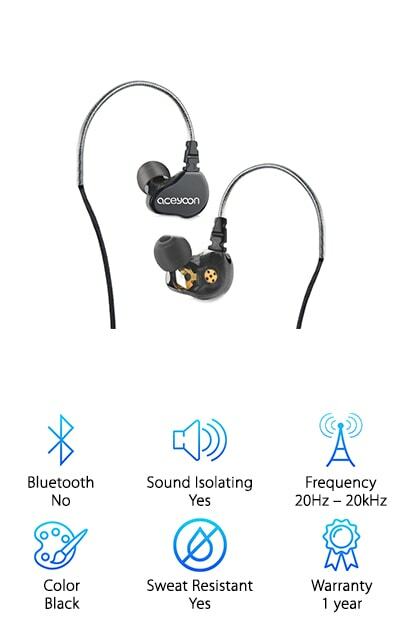 The Aceyoon In-Ear Monitor uses a dual moving, double speaker design that gives you a pure and high quality sounds you can really enjoy. 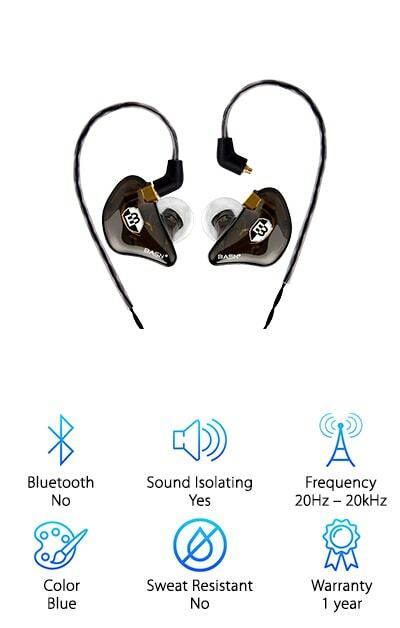 It does this with injection molded earphones that provide a low level of resonance and also decrease overall interference, which makes for a more natural sound. 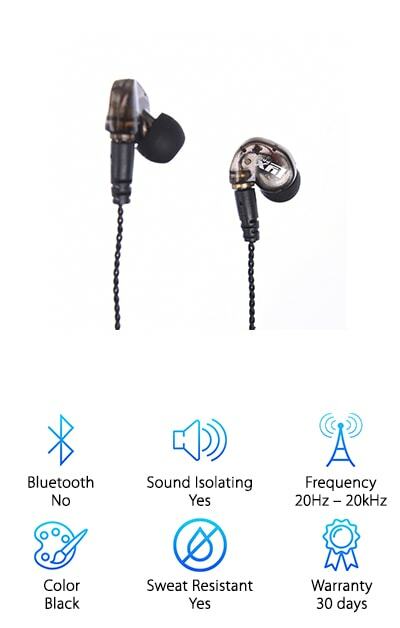 They even have a soft steel ear hook that ensures they stay firmly attached but don’t hurt your ear at the same time, keeping the pressure off and still isolating external noise. The cable is made with Kevlar, which means it’s super durable even compared to other monitors. You can connect to your favorite devices using a 3.5 mm audio jack and you get three different pairs of ear tips to get just the right fit in your ears. Get high fidelity and four total speakers to get the level of sound that you really want with a strong frequency range to separate each aspect of the music.